Ontario’s lush Niagara fruit belt gave birth to award-winning Pinot Noirs and Rieslings—but these days it’s producing a lot more than wine. In fact, the region is undergoing a small-batch booze boom: in the last four years, three new breweries and a craft distiller have sprung up in the region. This year alone, six craft beer festivals will be held there, and four more breweries are in the planning stages. 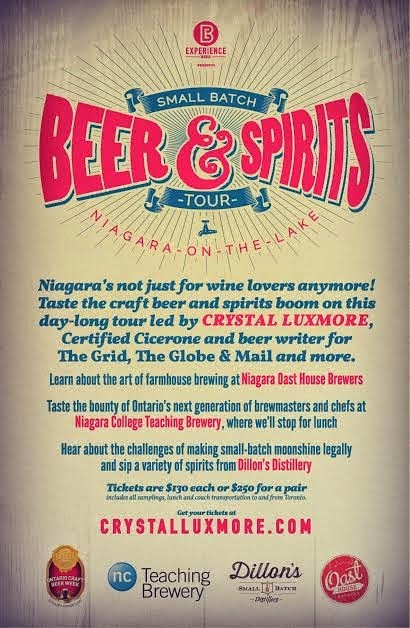 On Saturday June 21st the Small Batch Booze Tour will take food and drink lovers to Niagara-on-the-Lake to discover the boom—visiting Oast House brewery, having a two-course lunch at Niagara College Food & Wine Institute, and touring Dillon’s Distillery. Together these new makers are adding some new complexities to Niagara’s terroir: Oast House Brewery specializes in creating “farmhouse ales,” which are made using a spicy, fruity Belgian yeast and re-fermented in the bottle for weeks before being released. Oast House is one of the only breweries in Canada to have a temperature-controlled room built exclusively for bottle conditioning. The waiting list to get into Canada’s only brewmaster program, launched at Niagara College in 2010, is bigger than their student body. As for the graduates, the placement rate is 100 percent—making the campus, located on the Beamsville bench, the birthplace of Canada’s new generation of brewers. Then there’s Dillon’s Distillers, a family-run outfit that is devoted to making Canada’s first “real” rye whiskey, crafted from 100 percent rye (instead of the mass-market competitors which use corn, barley and other grains). The distiller based itself in the fruit belt so that it could harvest local fruits to craft its eau de vie’s, gins and bitters. Crystal Luxmore, a Certified Cicerone (aka beer sommelier) and beer columnist will be leading the tour. Get a behind-the-scenes look on this daytrip with tours by brewmasters and distillers, a two-course gourmet lunch with beer pairings and coach transport to and from Toronto.